... for the death of an oyster can reveal environmental changes or pollution that might have gone unnoticed. 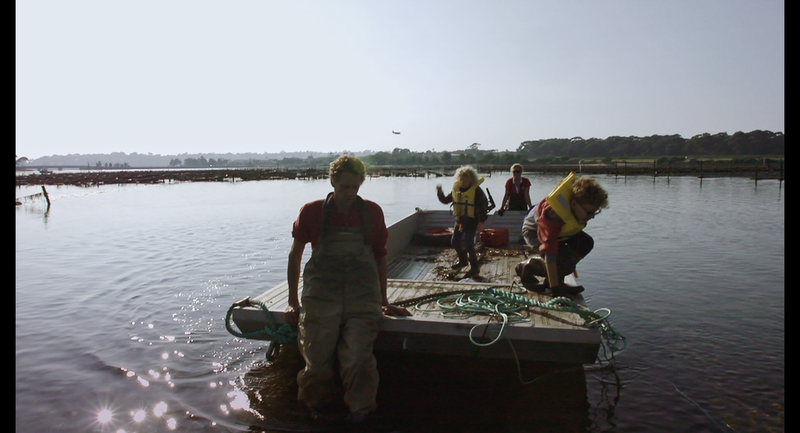 Oyster is a feature length documentary capturing the daily routines, chaos and drama of a lively, hard-working second generation oyster farming family on Merimbula Lake on the south-east coast of Australia. By documenting a specific microcosm of a farming family on Australia’s south- east coast, OYSTER presents its audience with a story, a landscape, an environment and characters who face practical, ethical and personal decisions about things that matter to them – feeding their family, getting the boys to school, running the farm, looking after the lake, keeping their crop of oysters healthy and figuring out whether harvesting new crops will protect their livelihood. This local story goes to the heart of matters of global urgency – climate, sustainability, farming, the health, livelihood and education of rural communities, and the challenges and uncertainties that come with farming a luxury product. Observational in style, OYSTER stands back to watch and witness. The film’s director Kim Beamish likes to sit as close to his characters as he can so as to become really intimate with the world they are experiencing. This intimacy invites the audience in, as if they are almost becoming a character too, a part of what is going on, and a part of the character’s experience. Dom and Pip Boyton are the main characters of OYSTER. Dom and Kim Beamish used to play together as boys, creating a life long rapport and a level of intimacy and trust which gives personal colour to the film and adds to the audience’s involvement in the story. OYSTER will not seek to tell the audience what to think about the ethics, morality or politics of the decisions that face Dom and Pip Boyton but, rather, will present their story. It is a story that shows what is happening for Dom and Pip, and their fellow farmers and community. The story leaves it to the audience to make their own decisions. OYSTER depicts the changes of rhythm as characters shift space and pace. The noise and mundane routine of tasks like running the oyster through 'cling clang' the grader is forgotten as Dom, Pip and the boys settle in at home to a meal. Later, exhausted, Dom is asleep on the couch, the television streaming cable, as Pip plays Candycrush and updates her Facebook account. When Dom takes the punt out on the water, the mood shifts again, to the vibrant colours in the wide open spaces of the lake and the sky. Pre-dawn, sunrise, the heat of noon, sunset, midnight – the oyster farmer harvests by the rhythm of the tide. The good times build up with a slower pace: clean water, good sales, family time, right decisions. Then the noise comes, the loud voices, the fast pace that breaks the good times down: bad decisions, storms, disease taking hold, family tension. This build up and break down – both visual and aural – is like the waves when their rhythm is building. It’s as if we are awaiting that perfect wave at the back of the set. Will it be good or bad? Kim Beamish is an award winning Australian filmmaker whose film ‘The Tentmakers of Cairo’ won the 2015 Margaret Mead Filmmaker Award at the Margaret Mead Film Festival and Prix Buyens-Chagoll at the Visions du Reel Film Festival. He has been a tutor in cinematography, editing and documentary production at the University of Canberra for a few years. Also having previously been on the board of OPEN CHANNEL in Melbourne, Australia. Pat Fiske has been producing and directing documentary films since the early 1970s and has been a prominent member of Australia’s independent filmmaking community. Her films have won many awards and screened in countless film festivals around the world. In 2001, she was awarded the prestigious Stanley Hawes Award for her outstanding contribution to the documentary industry in Australia. Denise Haslem ASE is a producer and editor with over 25 years experience in the film and television industry. She produced and edited the award-winning Mabo Life of an Island Man, produced DocA Portrait of Herbert Vere Evatt and A Calcutta Christmas and co-produced Risky Business and Steel City.. Started making Super8 movies at aged 13. Worked for 5 years at Channel 10 Sydney as telecine operator grading live to air, film processing tech and news camera/sound. Moved into sound post production and was awarded the 2007 Stanley Hawes award for ongoing contribution to documentaries. Moved to Tasmania in 2008. Michael Creswell Dooley is an Australian born pianist composer, song writer and producer. Studied classical and jazz piano, and composition at the Sydney Conservatorium of music. He has been enhanced by living and performing in the orient, India and the middle east for a number of years. He currently resides with his family in Canberra ACT, Australia. Screen the film at your local cinema. 4. Spread the word! Invite friends and community to buy tickets via the ticket link. Let us know (info@nondscript.com) and we will send you posters and flyers as well as help you promote the event. We may even be able to come? Tickets available through the Port Stephens Information Centre in Nelson Bay or below.